"Cast The First Stone" can be downloaded for free at AdultSwim.com. SLAYER guitarist Kerry King told Rolling Stone that he got the idea for the song while walking around Athens, thinking about all of the clashes that took place there over the centuries. "It's just about battle, not a particular battle," he said. "You cast the first stone, I'm gonna win." The "Repentless" title track went on sale digitally virtually everywhere in June. "'Repentless' is my Jeff [Hanneman] tribute," said King. "I call it the 'HannemAnthem.' It's my perspective of Jeff's perspective, it's what I think... If Jeff wrote a song for himself, 'Repentless' would be it." 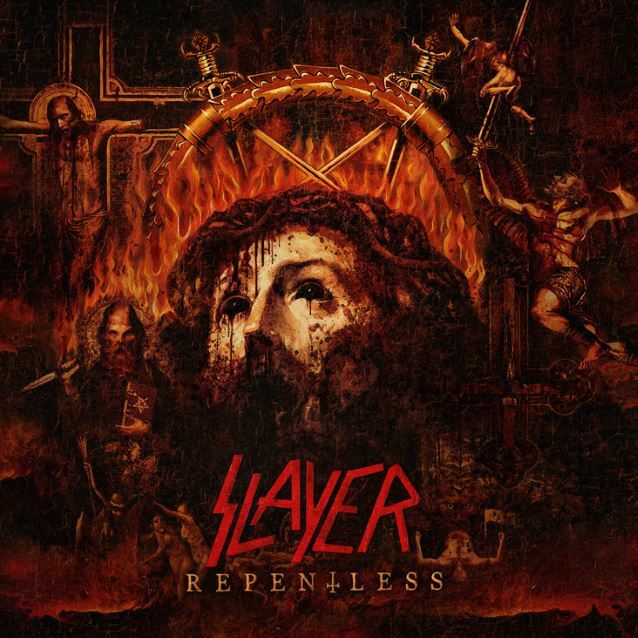 The highly anticipated "Repentless" is SLAYER's eleventh studio album, the first since 2009's critically acclaimed, Grammy-nominated "World Painted Blood" and the first with producer Terry Date (PANTERA, SLIPKNOT, SOUNDGARDEN). 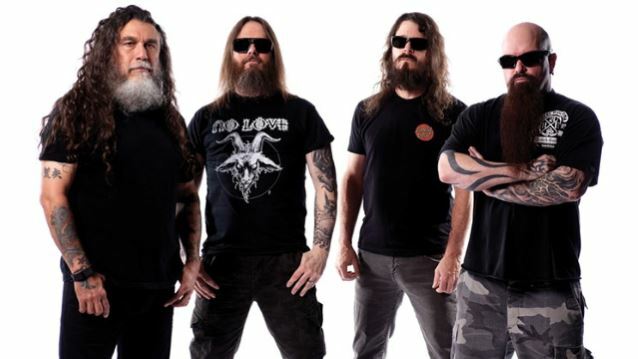 The band — Tom Araya (bass, vocals), Kerry King (guitar), Paul Bostaph (drums), and Gary Holt (guitar), who recorded lead guitar parts for about a half-dozen of the album's new tracks — started recording "Repentless" in March 2014, and made the track "Implode" available as a free download in April of that year. The band and Date continued to record between September 2014 and mid-January 2015 at Henson Studios in Los Angeles. For the album, "Implode" was completely re-recorded from the ground up, and "When The Stillness Comes", used as an instrumental track in a Scion commercial, got a revamped intro and all new vocals. "Repentless" also includes "Piano Wire", an unfinished song from the "World Painted Blood" sessions written by Hanneman. About the track, Rolling Stone wrote that it "begins with an eerie guitar line before evolving into a full-on-doom (and classic SLAYER) riff onslaught." King put it this way: "When I hear it, I think 'Jeff.' It sounds like a Jeff Hanneman song." The 12-track "Repentless" is, according to those who have heard it, a sonic assault of brutal, ominous, lightening-fast and heavy-as-hell music with lyrics that unmask what SLAYER knows best — the terror, the corruption and the societal turmoil that dominates our world.